This comprehensive one day symposium will help you gain a better understanding of the latest diagnostic services used to assist with solving process problems while remaining online. In-depth case studies will illustrate how our gamma scanning and tracer technologies are used to help capture real-time data to optimize production and provide a better understanding of your process. - Troubleshoot and diagnose hydraulic conditions within trayed and packed towers. - Locate heat exchanger leaks no matter how small. - A complete understanding of flows throughout the entire facility. - The diagnostic tools to look inside FCC's and optimize performance. 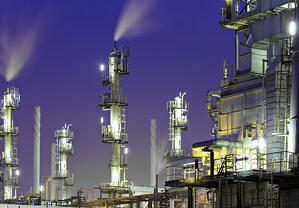 - Take control of your process using fixed density measurement gauges. - Gamma scans can help you understand if your trayed or packed tower has a mechanical, design or operational issue. - The patented FrothView™ technology is used as a quantitative tool to determine total tray froth and %flood. - To quantify the degree of liquid maldistribution in packed towers. - The value of baseline and pre-turnaround scans are used to detect subtle changes, evaluate the effect of tower revamps and assist with turnaround planning. - To detect the cause of off-spec product due to heat exchanger leaks and how to pinpoint the leaking exchanger(s). - To obtain an independent verification for flow meters to help you confirm data reported for environmental purposes is correct. - To identify fugitive flow in flares and other systems in addition to determining the origin of where the problem is occurring. - To detect leaking valves to determine if flow is bypassing the valve. - To troubleshoot and optimize FCC performance. - Nucleonic gauges are used to control a range of industrial process system levels, interfaces and material densities. At the end of the symposium, Tracerco's panel of experts will host a Q&A session discussing the latest industry challenges and how to measure the difficult to measure process issues. We encourage you to bring questions and problem situations you may be experiencing for discussion. Click the links below to download a copy of the symposium invitation for additional details.